When I was a little girl, I was given a garnet ring for my birthday. Garnet was my birthstone, and I loved its fiery scarlet hue and the way it sparkled in the sun. I wore the ring every day, never taking it off. That is, hardly ever. During the summer following my birthday, I went swimming with my family at a small nearby lake. My sisters and I pretended we were mermaids, searching the lake bed for hidden jewels. I never swam with my eyes closed- I loved the way rays of sun shone through the water’s silt and glinted on objects lying in the sand. At the ocean, we filled empty soda cans with sand and threw them into the deep, diving after them in a contest to see who would be the first to recover them. In the calm of the lake, we did not have to contend with the tide, so we tossed smaller objects in order to make the search more challenging. Toward the end of the day, my sisters tired of the game, and went to shore in search of treasures of the edible persuasion, leaving me alone in the darkening lake water. I tossed a small white stone a few feet away and pretending it was a rare opalescent pearl, ducked to the bottom to find it. Lost in my fantasy, I dolphin-kicked my way to the deep, searching the sand until my lungs burned for air. Each time, I found the stone and each time, my swagger grew greater. I imagined that perhaps I was a real mermaid who could find any treasure in my magic lagoon. But the rays of the sinking sun were weakening, and the pebble looked less and less like a treasure and more and more like a plain old river rock. I needed something more beautiful- something that would catch the light and glitter like a real jewel. In a moment of foolish daring, I slipped the garnet ring off my finger and dropped it in the water close to my feet. I plunged into the water to retrieve it but after searching the sandy bottom until I was out of breath, came up empty-handed. Again and again I searched, but my ring was not to be found. Realizing I had made a terrible mistake, I began to cry. After tearfully explaining to my father that I lost my precious garnet, I nervously watched from the shore while he trolled the lake bed like a submerged submarine. For several minutes he searched for the ring, but it was hopelessly lost, and I cried most of the trip home, sick over the loss of my most prized posession. 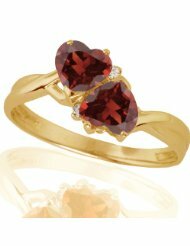 I never replaced the ring, although I still love the warm claret color of a garnet. That day taught me several life lessons. I learned I was not, nor ever would be a real mermaid. I learned to not allow confidence to overshadow discrimination. But mostly I learned to hold on to the things I love. Now that I am no longer a child, I have come to realize that the real jewels of my life are the people in my path, who work by my side, who live in my heart. Like a faceted russet stone that glitters in the sun, they reflect light, bouncing rainbows across the room, adding dimension and beauty to my life. I thought of this while I was talking to my youngest daughter this week. As mothers and daughters do, we sometimes struggle to agree, and in my frustration, I was tempted to speak harshly and sarcastically. But she is my garnet ring, a precious gem of scarlet and gold and I realized to speak unkindly to her is to toss her into the deep, trusting that I can find her again later. What if I were to lose her? What if I were to dive deep, swim until my lungs scream, search the sandy lake bottom, and come up sputtering, unable to find her gleaming in the light? Thankful for the reminder, I bit my tongue and choose my words carefully. Words of love, laced with kindness. Words that are warm and full of light. Words that hold her close and tell her that she is my treasure. Because she is. And where your treasure is, there your heart will be also.